However, I kept wrestling with my conscience. Would I really be alright if I denied myself the opportunity to see the performer who effectively got me interested in musical theatre to begin with? As usual, I am so glad I finally made up my mind and decided to go, as I can now say that without a doubt this had been one of the most memorable theatrical experiences of my life. For those unfamiliar with the story, How To Succeed[...] is the fictional tale of J Pierrepont 'Ponty' Finch (Jonathan Groff), a young charismatic window washer who, with the help of a book entitled 'How To Succeed In Business Without Really Trying', leaves the world of window washing behind and finds a job in the mail room of the World Wide Wicket Company instead. There, with the help of a secretary called Rosemary (Cynthia Erivo), Finch does his best to work his way to the top, as quickly as possible. Unfortunately, Bud Frump, the nepotism-minded nephew of the company's president J.B Biggley, is also trying to climb the career ladder, and schemes against the ambitious Finch. 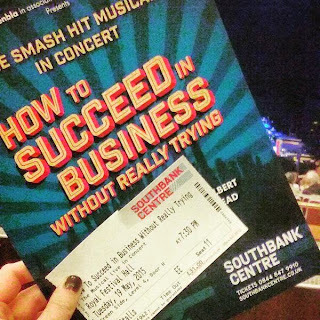 Although the book did seem a little dated, and this fact was very much brought to light in the concert setting, How To Succeed[...] did have some brilliantly funny moments. I loved the voice of Finch's book, which guided the young businessman through the ruthless corporate world, and Hedy LaRue, Finch's ditzy secretary had some hilarious one liners. However, what really impressed me was the music. The songs ranged from ridiculously catchy to hilarious, to simply breathtakingly beautiful. 'Rosemary', a lovely duet between Finch and Rosemary near the end of act 1 was just gorgeous. Jonathan Groff's voice soared across the room and the audience hung on his every word. There were swoons aplenty and rightly so. Meanwhile, the near end of act 2 group number 'Brotherhood Of Man' had me grinning from ear to ear. It was obvious that the cast were having a brilliant time, and their enthusiasm was infectious. In fact, the cast was wonderful in general. Jonathan Groff clearly knew the part very well (and so he should, he played the part of Finch in a school play over a decade ago. Clearly How To Succeed[...] is a show which he very much enjoys!) and barely even glanced at his script thought the whole show. He shone vocally, his comic timing was superb and his innocence and eagerness made him impossible to take your eyes off. I was also fortunate to have seen Cynthia Erivo perform for the first time. She definitely lived up to the hype that surrounds her, delivering effortless vocals and adding charm to a rather one dimensional character. I was also drawn to Ashley Robinson, who played the devious Bud Frump. His performance was very physical, and I loved watching him slink and sulk around the stage. I wasn't familiar with him before, but I'll certainly be watching out for him more in the future. The only cast member who I felt wasn't as prepared as the the rest was Clarke Peters as J.B Biggley, the president of the company. He seemed unfamiliar with his lines and flubbed a couple of them, but given the extremely short rehearsal period for this concert, I was prepared to give him the benefit of the doubt. Although the musical itself is definitely not one I'd rush out to see again, I found the concert a hugely enjoyable event. Although with a total running time of 3 hours (!!! ), both acts ran the risk of dragging, the performers did their best to make sure every second was as charming and exciting as possible. I'd do anything to see some of the performances again and I was pleased to hear that the show was recorded on the night, and from what I understand it will be aired as a radio play at some point in the future. Jonathan Groff simply has to return to the West End and I hope that if the right project comes up this does happen...and soon...please. He was a joy to watch, and for me personally seeing him perform live was a literal dream come true. I'll definitely pay more attention to concerts such as this one now, especially if the quality of the performances are as high as they were in How To Succeed[...]!